If one of the sites on your site list is showing as amber, you can click on the site to show more details. Select the Status tab to show details of any updates required. 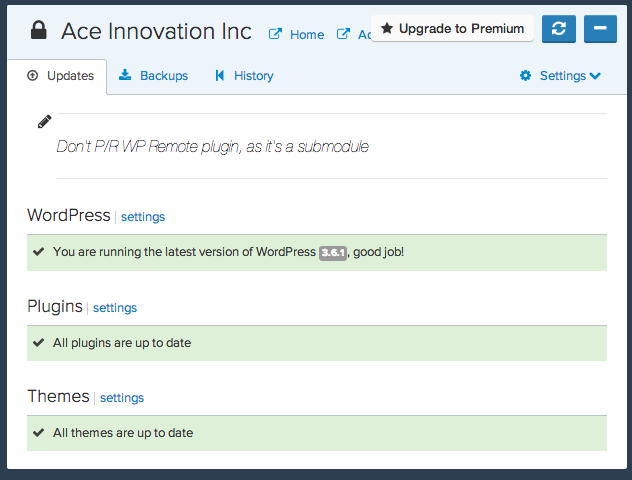 The Status screen is divided into three sections showing available updates to WordPress Core, Plugins and Themes. WP Remote will be monitoring all of your installed themes or updates whether active or not, but only those requiring updates will be shown in the list. 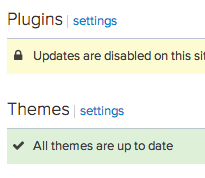 To see a full list of all your themes or plugin click the Settings button and then you can toggle between Settings, which will show all of your sites and Updates,which will only show those plugins or theme that require updating. Each item has an update button. Hovering over the button shows you the new version that is available and clicking on the button updates the item. 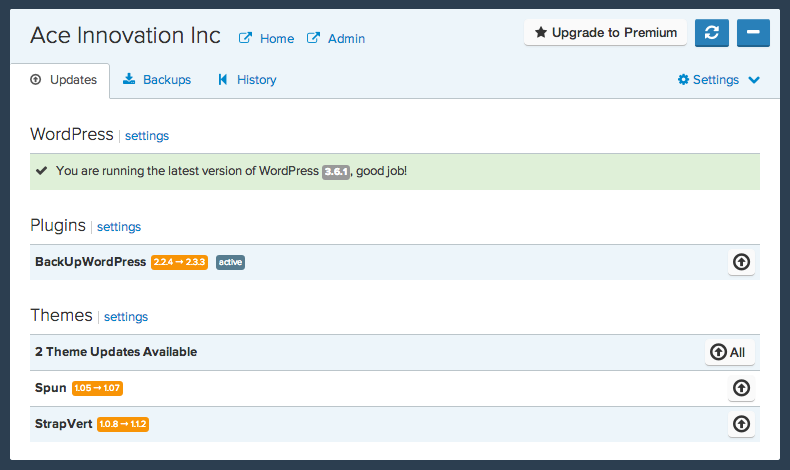 Where there are multiple updates for plugins or themes there will also be a button that allows you to Update All. When you click on Update or Update All button WP Remote will automatically update the selected site(s). Once an update has been done or if there are no updates available you will see a message letting you know that you are up to date. When all updates have been made for a site you should see the status traffic light on the site list turn to green.